KPC’s green agenda has gone a notch higher with the planting of over 5,000 trees in our major installations across the country. The tree planting drive that goes hand in hand with impressive landscaping to conserve and beautify the environment which hosts KPC’s multi-billion assets is an initiative spearheaded by the Administration and Environment departments. Talking to Kenpipe News, KPC’s Ag. Facilities and Right of Way Manager James Nyamongo says that businesses, KPC included, must re-look at their operational practices to ensure they are friendly to the environment. 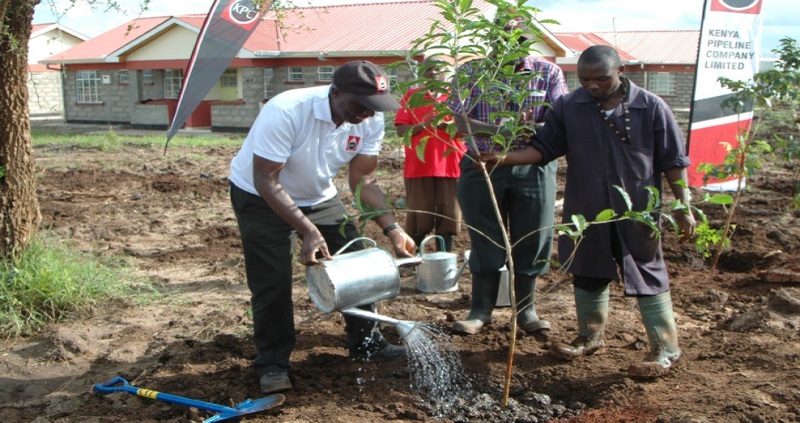 “KPC has embarked on an agenda to become a green organization whose activities are friendly to the environment in line with one of the company’s core values care for the environment”, Nyamongo said while planting trees in KPC’s pump station number 8 in Konza recently. So far, the green initiative has extended its tentacles to several depots and stations namely Kisumu, Eldoret, Nakuru, Samburu, Konza, Sultan Hamud, Makindu and Mombasa. “Trees have been proven to be excellent absorbers of hydrocarbon emissions. By June 30th 2019, we will have planted over 10,000 trees and landscaped all our depots and stations to world class status,” added Nyamongo who is an environmental conservation enthusiast. Earlier in the year and in line with this green initiative, KPC led by the Managing Director Joe Sang participated in the national tree planting exercise that was launched by H.E. President Uhuru Kenyatta. This venture was in line with the Government’s plan to increase the forest cover in the country to 10 per cent before the year 2022. Studies have shown that the cause of global warming is believed to be over 200 years of a build-up in carbon dioxide in the atmosphere mainly by businesses who are responsible for a large portion of global carbon dioxide emissions. To counter this, organizations are coming up with green agenda initiatives to manage and minimise their environmental impact. In this respect, it is increasingly important that KPC walks shoulder to shoulder with other global organizations to put measures in place that will help conserve the environment from the effects of its increased business activities.